Smaller size with large organizational benefits. Create your own planner or address book in a matter of minutes. It is made of the same durable material as other C-Line binders, but offers a more compact storage option. Whether you are looking to create your own daily planner or would like a way to sort store coupons, the mini binder line is ideal. Smaller size with large organizational benefits. Stylish on-the-go organization for items or documents up to 5 1/2 x 8 1/2 in size. 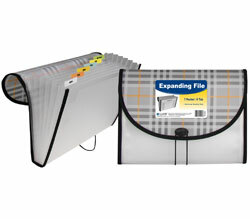 Durable polypropylene binders feature large interior pocket on the back cover for extra storage. Acid-free material protects documents and photos by eliminating the risk of photocopy transfer. Assorted colors include blue, aqua, purple, pink.